1:08 turned up just after passing the Sun timeline. That added juice, so I re-entered. 1:00 that is my planned trading for the day, so I am done. The screens will run to the close. Thanks for coming. See you next week. 12:00 yesterday, the low was timed by the exchange rotating past that cluster. being 180 degrees to the Saturn, Sun, Mercury, Venus cluster. 9:22 opening sharply up after the Fed's discount rate cut. Overnight traders caught a nice move. 8/17/2007 11:30:53 AM Mountain TG:: I let it run past my 7 pt profit target since it had some good juice. Tried for Al's 49.50 while pulling stop up to 47.50. +9 is pretty darn good for a Friday in August. Time to go take dogs for a walk. Thanks Al, your mention of juice on the clinic helped me get the extra two, your Chaos classes got me the first 7. Have a good weekend. 8/17/2007 11:09:09 AM Mountain TG:: I've also had to modify my rules for past few weeks. On 20/110 cross I usually am taking trade within 1.25 to 2 points from 110 exma. Still doing that. Usually a 3 pt stop is good, I've gone to 4.25 pts initially and then after we get some good 20/110 separation I'll move it to 3 pts. At that point I don't mess with the 3 point stop until trade really gets going. Previously once 4 points were made I'd lock in 2 and target 5. Now I'm targeting 7 and not locking in 2 until 6 pts have been made. It's been working pretty well more often than not. I went long at 38.5 too on initial 20/110 cross and have managed to hang in there based on having that rule set already in place. 8/17/2007 8:17:06 AM Mountain TG:: Scrap that, that was the 8:15-8:16 1 minute bar that did the 52.25 pts. 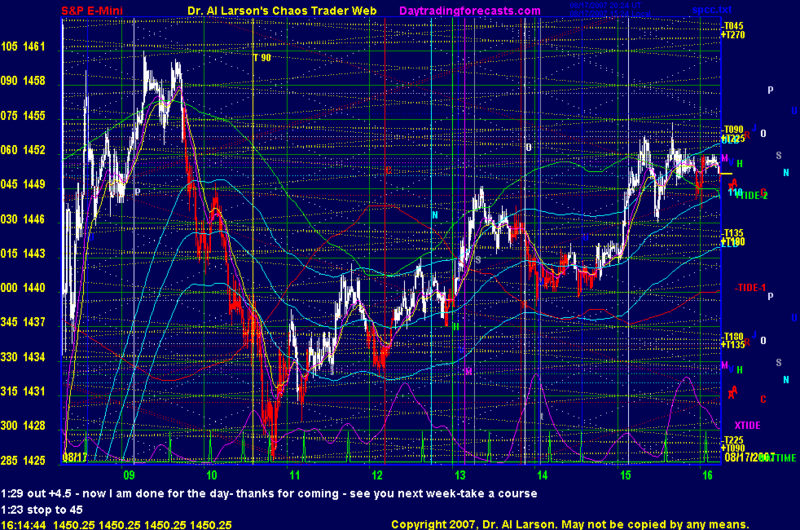 8/17/2007 7:58:09 AM Mountain TG:: the 3 minute e-mini 8:15 to 8:18 bar opened at 1419.25 and reached 1471.5. That has to be some sort of a record.